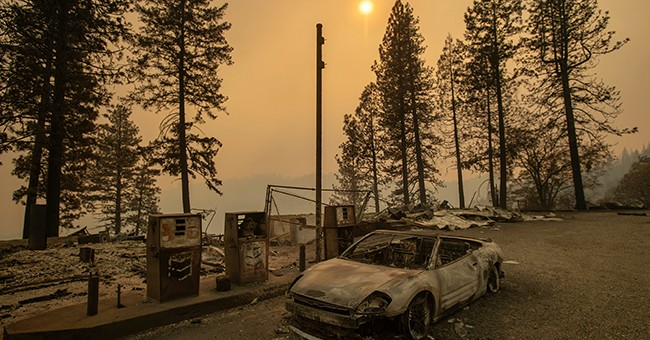 Outgoing California Governor Jerry Brown calls the conflagrations "the new abnormal," and predicts it "will continue, certainly, in the next 10, 15, 20 years." How defeatist. Trump, in contrast has the right idea. He's vowing "we're going to have safe forests." Science is on Trump's side. For a century, forest mismanagement has resulted in huge blazes. Amid claims that global warning is the culprit, history shows that California suffered far bigger fires decades ago. The death toll from the Northern California fire known as Camp Fire sets a gruesome state record, because many more people have settled on the forest's edge. But in 1936, fires statewide burned 756,696 acres, five times the size of Camp Fire. Fires in 1934, 1942, 1943, 1944, 1950 and 1963 also vastly exceeded Camp Fire's size. The press repeatedly baits the president, asking him about global warming and trying to discredit him as a climate change "denier." California's recent prolonged drought and record temperatures played a role in turning the state's forests into a tinderbox. It's possible climate change contributed to the high temperatures and drought. Debating that is a distraction from what must be done now. Scientists put significant blame for the fires on mistaken policies by state and federal forest agencies -- things that could have been changed to avert the disaster and still can be altered with more predictable results than trying to control the world's temperature. The scale of the disaster demands immediate action. Camp Fire has already swept across more than 235 square miles, killing 79 people as of Tuesday, with hundreds more missing, and whole towns reduced to soot. The fire, predicted to burn until Nov. 30, has put San Francisco and other cities under a pollution cloud worse than anything in India or China. The University of California, Berkeley, canceled classes and is distributing masks. Californians were warned of this impending inferno. Earlier this year, a bipartisan state panel, the Little Hoover Commission, reported that for over a century state and federal forest managers have mistakenly put out small fires instead of allowing them to burn naturally to rid woodlands of dense underbrush and deadwood. The Little Hoover panel condemned this "century of fire suppression." In 2006, the Western Governors' Association cautioned about another contributing factor: failure to thin the forests. After the spotted owl was added to the list of threatened species in 1990, President Bill Clinton imposed limits on timber harvesting, which fell by 80 percent, and halted new road building in federal forests. Too bad. Roads serve as natural fire barriers, and also enable firefighters to get to the blazes. Add to these mistakes the drought that gripped California beginning in 2012, the onslaught of tree-killing bark beetles, and then record heat in 2017, and the result was an inferno waiting to happen. But the Little Hoover Commission predicts "proactive forest management practices" can create healthier forests that will "check the speed and intensity of wildfires." These practices will return forests to the natural conditions of previous centuries, when forests had 40 trees per acre instead of hundreds. Even California's own legislature recognizes that forest mismanagement is the tragedy's major cause. The legislature passed a law two months ago to implement many of the same changes Trump's now being mocked for proposing -- controlled burning, underbrush removal and forest thinning. This multifaceted approach is too much to put in a mere tweet. But University of California forest expert Yana Valachovic concedes that Trump's "general sentiment is correct." Sadly, his liberal critics can't see the forest for the trees.